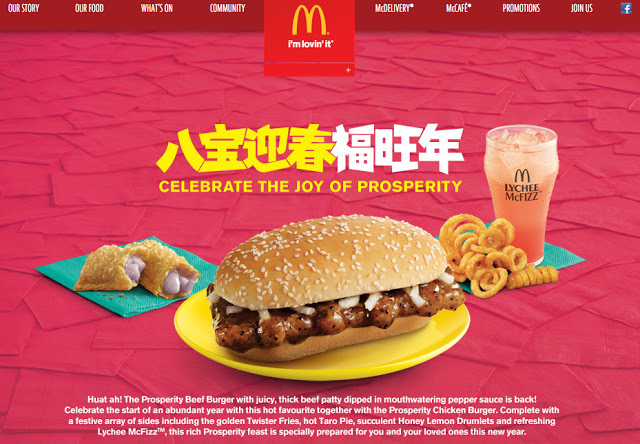 I had written about McDonald's customizing its menu for local markets before, but this was the first time I saw the McDonald's Prosperity Burger -- a special offering for the Chinese New Year holiday. 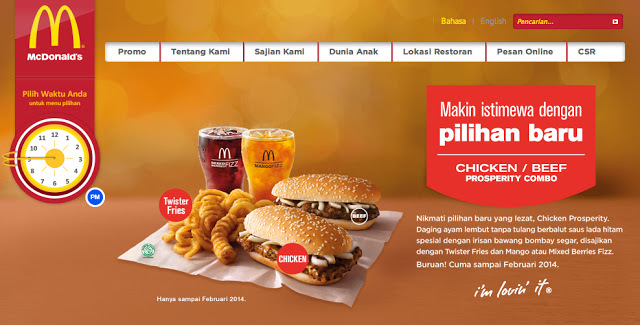 It's back in Malaysia this year, as announced on the McDonald's Malaysia website. 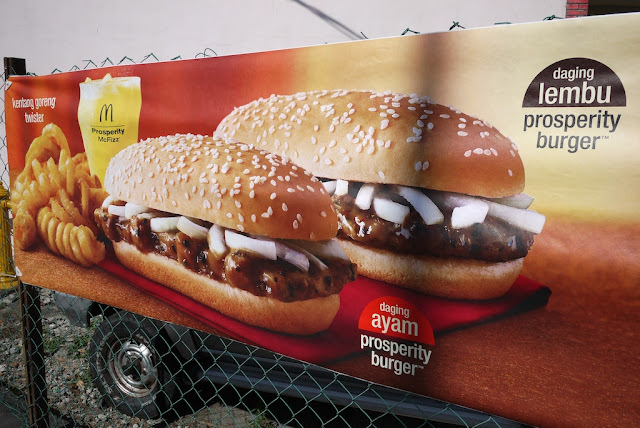 Minter isn't alone in his opinion of the Prosperity Burger (see here and here), and he may be thrilled to hear it's available outside of Malaysia. 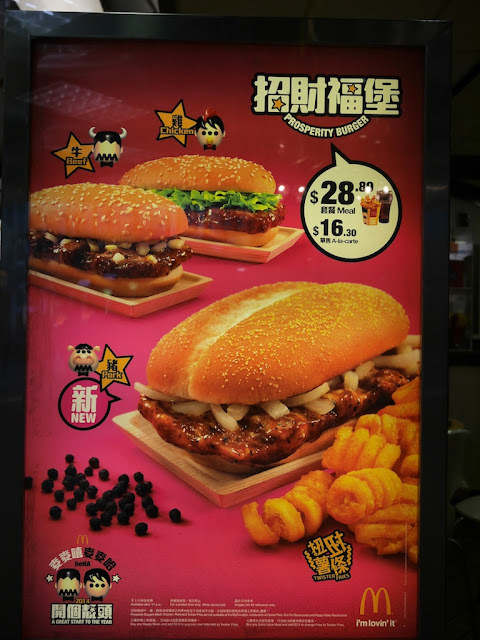 For example, today in Hong Kong I saw an advertisement for the incomparable burger. The McDonald's Hong Kong website has a similar promotion. 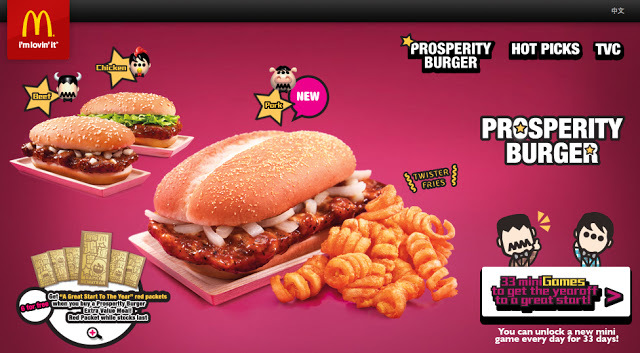 McDonald's in Hong Kong not only has the beef and chicken Prosperity Burgers found in Malaysia but also a pork version. Given that Islam is the state religion in Malaysia, it's not surprising McDonald's has not introduced the pork version there. Nothing is more mouth-watering than the anticipation of biting into the Prosperity Burger’s succulent, juicy beef patty, dripping with lip-smacking black pepper sauce, topped with silvered onions on a sesame seed bun, and many Bruneians look forward to its return every year. Bruneians (and Adam Minter) rejoice! Despite all of these countries offering the Prosperity Burger, most Chinese in the world will still have to seek another way to celebrate the Chinese New Year. 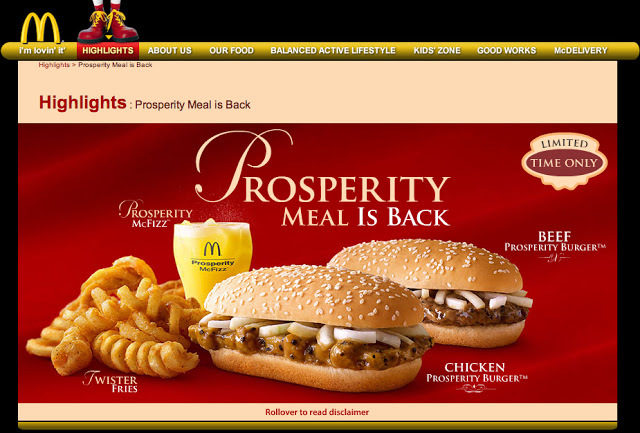 McDonald's in mainland China does not offer the Prosperity Burger. Perhaps people there can enjoy a McDonald's breakfast hot dog instead.